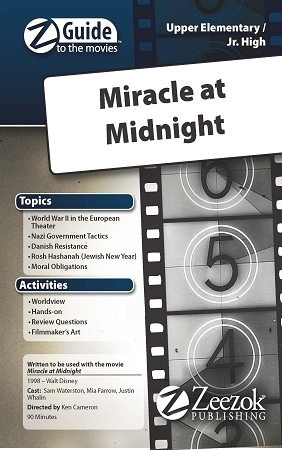 Zeezok Publishing's Z-Guide to Miracle at Midnight is a great way to incorporate media into your study of World War II. When the people of Denmark learn that the Nazis intend to round up all Danish Jews for transport to concentration camps they quickly take action to protect their fellow citizens. Using fishing vessels across the sound they ferried over 7000 Jews to neutral Sweden in approximately two weeks time. A nation under martial law and occupied by an invading country shows kindness and bravery to an oppressed people: their neighbors and friends. Miracle at Midnight follows the Koster family through their personal struggles to determine their moral obligations in the war and their various efforts to assist their Jewish friends. The true story is a remarkable testament of unity and sacrificial risk in a Nazi-dominated world of violence and aggression. Meaningfully incorporate Hollywood media into your study of World War II by using Zeezok Publishing's Z-Guide to Miracle at Midnight. Ten learning activities will challenge viewers to research the meaning of the Star of David symbol and the significance of Beethoven's Ninth Symphony to the Nazi Party. Find double entendres in the screenplay; trace the routes of fishing vessels from key Danish ports to Sweden; and celebrate your own Rosh Hashanah feast. In The Filmmakers Art study how music evokes different emotions in certain scenes and discuss your own family's sense of moral obligation in the For Family Discussion section. This Disney film portrays an actual miraculous event in 1943 and presents a loving strong family in a positive light. Its an excellent addition to any study of the 1940s.